At Stellar Adjusting, our team of professionals includes attorneys, contractors, loss consultants, public adjusters, former insurance company adjusters, estimators, real estate professionals, and appraisers. Stellar also brings in contacts from our extensive network on a case-by-case basis so that our clients get the best adjustment possible. This team of experts includes Senior Public Adjuster of Stellar Adjusting, Rami Boaziz. Get to know Rami Boaziz by reading the interview below. Prior to becoming a Public Adjuster, I was working as an Attorney. I have been licensed as an attorney in Florida since 2005. After graduating law school and becoming a member of the Florida Bar in 2005, I went to John Marshall Law School to obtain a Masters of Law in Real Estate Law which was completed in 2006. When the real estate market crashed in 2008, it was pretty difficult finding work as a real estate attorney. I also had just gotten married in 2008 and wanted to try something completely new and different yet at the same time applying my legal knowledge and background to an industry that should really be viewed as consumer advocacy. Even though I only became an adjuster in 2008, I saw a real opportunity to help consumers who were still dealing with issues with their insurance claims even three years after Hurricane Wilma hit in 2005. How did Stellar come to be the company it is today? Stellar has grown significantly from the time I first became involved with the organization. While we are not the largest public adjusting firm in Florida, we are also not the smallest. We take a very comprehensive approach to working on an insurance claim to ensure that we are zealously advocating for our clients by ensuring that a thorough review of the policy and damages is done by our team of experts to ensure that we are presenting the most complete claim to the insurance company on behalf of our clients. What is your role at Stellar Adjusting? I currently work as a supervising adjuster for Stellar. 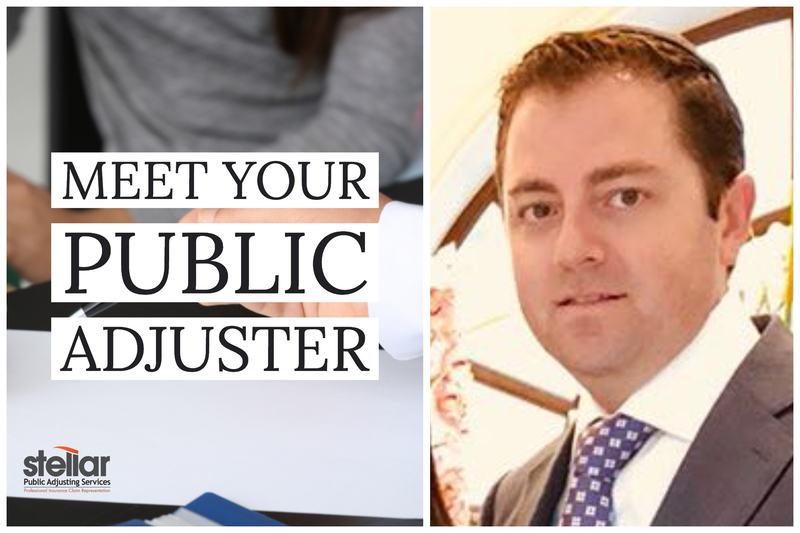 I also enjoy training and guiding new adjusters into the industry and helping them become better every day as Public Adjusters advocating for clients of Stellar as well being exemplary adjusters in the industry. I wish there was something such as a typical day. Each day is different and that is what keeps this job interesting and exciting. Many days I spent my time driving around to and from different appointments that include visiting potential clients, conducting inspections, working an appraisal of an insurance claim, handling mediations on behalf of our clients, attending depositions and even testifying in court. The satisfaction of knowing that without the guidance and assistance of our team at Stellar, our clients would not be able to properly recover from the losses they sustained to their home or business. Most clients don’t understand how cumbersome and tedious the process is which causing the claim to take longer to resolve than everyone wants, but at the end of the day, I want to make sure that I am being the best consumer advocate that I can be. Learn more about Rami here. Rami Boaziz and our team of experts at Stellar Adjusting is here to help you with your insurance claims! Contact Stellar Adjusting today for a free claim analysis.